Michael Outinen and Forrest Sherman are on a journey of self-discovery while exploring the country. These natives of Michigan are walking cross-country, making stops along the way to meet people, share their personal story and hear stories from people they’ve never met before or probably will never see again. Their odyssey began on Dec. 5 in Jacksonville Beach, Florida, where they stocked up on supplies and headed west to Seattle. On Wednesday they ventured through Pahrump before heading into Death Valley. It’s the first time they’ve visited the western United States. Outinen, 23, grew up in Marquette, Michigan, and attended college in Detroit before leaving without a degree because work life took over. Outinen met Sherman, 24, who was finishing up studies at the University of Michigan and found jobs, but both seemed discontented with their lives. Outinen said walking across the United States has always been on the back of his mind and he began thinking more and more about it for the past few years. The journey has offered the opportunity to discover, explore and at times, marvel at the sights, sounds and feel of towns and cities they otherwise wouldn’t experience. Sherman, who charted the course, said he decided the duo should take a southern route through Mississippi, Alabama, Louisiana and Texas, ending up in Houston before continuing northwest. Roughly five months into the trek, Sherman and Outinen arrived in Pahrump from Las Vegas. Outinen said he’s enjoyed the desert landscape of the Southwest. Both men agreed that wind has presented some unforeseen challenges. To alleviate undue physical stress and strain, both men use jogging strollers to carry their supplies, which Sherman said made the trip more manageable. Inside the strollers are small one-person tents, non-perishable food items, cell phones and other provisions. The most important supply for both men is the one that weighs the heaviest, Outinen said. The kindness of strangers along the journey was something both men have encountered time and time again for the past five months. Outinen said though there’s still long way to go, he now has a different perspective on people in general. Outinen also noted that many people have actually offered the pair rides and other help but they graciously decline, but there have been exceptions. Not everyone the pair encountered displayed the kindness and concern they’ve seen with others, especially when both are on the road. On more than one occasion, they were nearly run down by inattentive drivers, most recently while traveling into Pahrump from Las Vegas. Both walk against traffic because it’s safer to see cars when they are approaching. They carry an American flag to make themselves more visible. Since they began, the men try to stay on marked highways and paved roads. Though they use an internet application to chart their course, Sherman said, it’s not always reliable. Outinen and Sherman would like to reach their destination of Seattle by July 4. 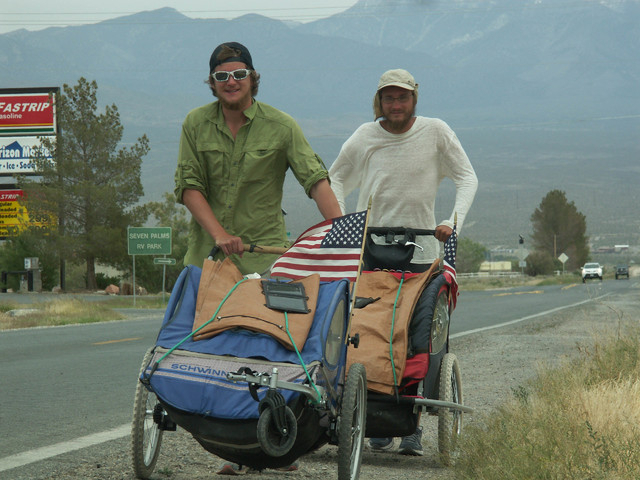 With roughly 1,100 miles to go, both said they have learned much about themselves. Sherman, on the other hand, said he learned something too. Family support both men’s adventure said was very important as they began their journey. Sherman meanwhile, said his mother had a different perspective on his decision to walk across the country. As far as any advice for anyone who is considering doing a similar journey, Outinen said the person should avoid procrastination and jump in feet first. After spending about a week in Seattle, both men will make their way back home to Michigan. Outinen said they plan on getting there by a much faster means of transportation.